With the July Fourth holiday approaching, many of us will soon be firing up our gas and charcoal grills, smokers, hibachis and Big Green Eggs. But, like me, perhaps you sometimes get into a barbecue rut. You know, one too many boring burgers or burnt steaks. Well, here are a handful of interesting new books about barbecue and grilling that can help rock you out of that rut and will encourage you to think a bit out of the barbecue box. As owner of Bottega Ristorante and founding chef at the acclaimed Tra Vigne, Michael Chiarello has been named Chef of the Year by both Food & Wine magazine and by the Culinary Institute of America. In Live Fire ($35), Chiarello turns his attention and expertise to cooking outdoors. However, this is much more intriguing than the standard Grilling 101 book. Live Fire is divvied up into six main sections, each devoted to a particular method of outdoor cooking: “contained” grilling (such as the Weber grill), the hearth, the plancha, the fire pit, the hotbox and the rotisserie. Chiarello provide useful introductory information and tips on various cooking implements and tools, along with a helpful list of “must-have” pantry items. Still, some readers might find parts of Live Fire daunting. I thought it was an unusual editorial choice, for example, that the very first recipe and instructions in the book are for cooking a whole lamb hung on an iron cross over a fire pit—not exactly rookie material. Further in, though, there’s a great chapter devoted to cooking pizzas on the grill, recipes for shellfish utilizing a Spanish cataplana, tuna loin cooked Prime rib-style, desserts like roasted strawberries with panna cotta and much more. Live Fire will open new doors to your outdoor cooking world. 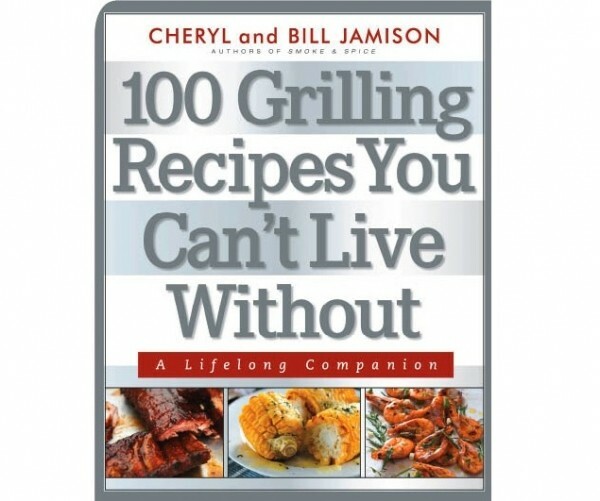 Celebrated grilling gurus Cheryl and Bill Jamison are the authors of six best-selling books about grilling and barbecue, including one of my favorites: Smoke & Spice. Now, they’ve assembled 100 of their favorite recipes and published the collection as 100 Grilling Recipes You Can’t Live Without ($16.95). In addition to recipes, the Jamisons dispense time-tested tips for barbecuing and grilling: time and temperature, charcoal versus gas, grilling for large parties and more. From there though, it’s all about the recipes, and there are some great ones. One of my favorites is for a grilled cheese sandwich on a stick; very clever. Grilled duck breasts with Armagnac and lavender-honey glaze are pretty hard to beat, too. For south-of-the-border flavors, the cumin-rubbed carne asada and Baja fish taco recipes are slam-dunks. And for dessert, I recommend getting the kids involved in cooking up colorful kaleidoscope fruit kebabs. We’ve tackled the topic of “barbecue” versus “grilling” before, so I won’t beat that dead horse again here. But for lovers of serious barbecue, Robb Walsh’s Barbecue Crossroads ($24.95) is a godsend. The subtitle is Notes & Recipes From a Southern Odyssey, and that’s precisely what this terrific book is: an odyssey. So much more than a mere collection of recipes, Barbecue Crossroads is the account of Walsh’s barbecue pilgrimage—beginning in Texas and working east to the Carolinas—providing a window into an American cooking heritage that is being lost in some places, but also being preserved in others, all beautifully photographed by O. Rufus Lovett. For example, in the chapter called “Fresh Air and Parched Peanuts,” Walsh takes readers inside Fresh Air Barbecue in Jackson, Ga., where fifth-generation Jackson natives cook up their famous Brunswick stew (once made with squirrels and pig heads), and also investigates the wondrous culinary delight that is the archetypal Georgian road food: the boiled peanut or “goober pea.” Recipes in Barbecue Crossroads range from secret slaw and hushpuppies instructions, to those for barbecuing a whole hog. This is an excellent book about real American cuisine, one you’ll want to pass down to your grandkids. Speaking of cooking whole hogs, I really like a nifty little book by Tom Rea called How to Roast a Pig ($24.99). Tom Rea is a young British chef who grew up fishing, foraging and shooting. He’s worked at the award-winning Coach & Horses gastropub and at the prestigious Jolly Sportsman. He knows a lot about meat. The entire book is devoted to a single animal: the pig. And it’s a graduate course on all things porky—like, the parts of the pig and how they should be used, meat carving and butchering, slow-roasting versus oven-roasting versus pot-roasting and much, much more. There are recipes for pork belly, for spare ribs, for chops, for hams, for tenderloins—the pig list goes on. Pork confit, anybody? And, of course, there is detailed instruction on how to roast a whole hog. Trust me, after sinking your teeth into this pigfest, that’s exactly what you’re going to want to do.